NES The Legend of Zelda (USA PRG0) in 22:38.13 by Baxter & jprofit22. It is a large game that normally takes days to beat, but at TASVideos, we often reduce games to the minimum necessary in order to complete them. 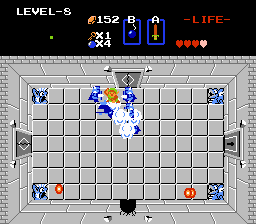 This is the sixth The Legend of Zelda TAS at this site (not counting the alternate movies), and is ~86 seconds faster than the previous movie, largely due to better optimization and manipulation of item drops.